The partially familiar face was Freddie, who I have not seen in many years. I worked with Freddie when he was on the cusp of his adolescence. I remember him as being an intelligent and extremely likeable fellow who had some pretty tough problems with his handwriting and social skills. He made a lot of developmental progress while I worked with him, and as with most kids there seemed to be a time when he just no longer needed the direct intervention. The last day of seeing a child for therapy is always a little bittersweet. About 5 years after he was discharged he visited my office and delivered a package of candy. At that time he was near 18 and we had not seen him for a while but he felt compelled to ride his bike over and visit. I was not there that day and I have long regretted that I missed the opportunity to see him. What sticks in my mind about Freddie is that he opened up the first day I met him and told me that in his perception he was a really cool kid up until kindergarten and even during kindergarten he was popular and had a lot of friends. However, he had some learning difficulties and he was 'forced' to repeat the school year. In his mind that equated to absolute relegation to the trash heap of the school social hierarchy. He stated that from that moment on he was known as "Mr. Held Back" which was akin to having to experience "EMOTIONAL HUMILIATION" on a daily basis. Now I don't know if other elementary school children actually called him "Mr. Held Back" but it didn't matter because Freddie THOUGHT they did. I capitalized "EMOTIONAL HUMILIATION" purposely, because there has to be some way I can transmit how large of an issue this was for him. Freddie hurt, and I listened. I tried to help. Children (and their parents!) often give little gifts to their therapists for holidays or events. At some point in time Freddie gave me a Newton's Cradle, which is the photograph at the top of this entry. It still sits on my desk and it is a daily reminder of Freddie and his keen mind that was interested in physics. 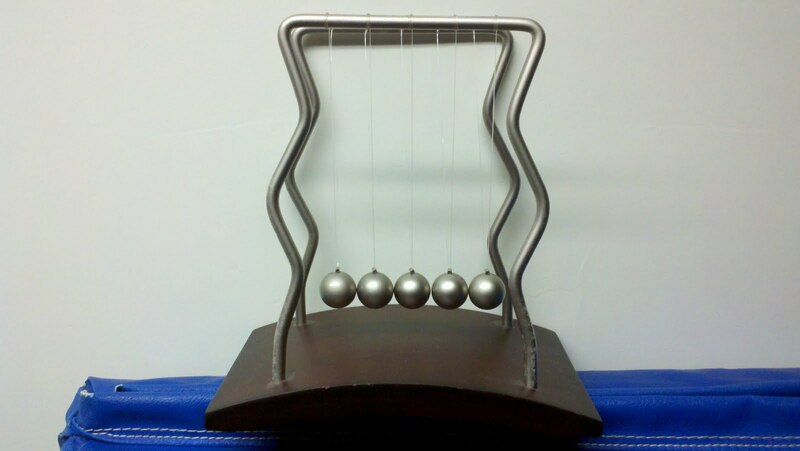 To me, that Newton's Cradle also represents the significant restraint contained within those natural laws that dictate the motion of bodies in space based upon directed forces, velocity, and mass. I never talked about those constraints with Freddie because the whole point of intervention was to find a way past the forces that constrained him. In that way it was an ironic gift - a fact that I am absolutely certain would not be lost upon him if we discussed it today because he had an extraordinarily keen skill for analysis, even if he couldn't write legibly to proverbially save his life. There is a lot that an occupational therapist can do for a child - handwriting can be improved, organizational skills and systems can be practiced, and even to some degree an OT can help children develop social skills and point out ways to improve interaction with a peer group - even when the child believes that the peer group practices EMOTIONALLY HUMILIATION at every turn. No matter what I tried, I don't know that I was ever able to find a band-aid large enough to cover that wound of EMOTIONAL HUMILIATION. Really, how can you fix such a thing? Well after seeing Freddie on Facebook over the weekend I came to my office this morning, pulled out his chart and noticed that he is over 21 years old. I also noticed that I have not seen him in over eight years. Under this context, I am not obligated to keep his medical records any longer. So I imagined I could defy the laws of physics. I grabbed a hold of the constraining tether of EMOTIONAL HUMILIATION that returned his pain at a roughly equivalent velocity back at his actions and I dumped his file into the shredder. Now there is no record of emotional humiliation attached to his name in the real world and I have found a way to completely bypass the rules of how momentum and energy are conserved in that system. Only echoes remain - edited and recorded on the Internet so someone else can learn - call it a system in a parallel reality that is only loosely connected to the real thing. And I wish freedom and peace for Freddie, who in my opinion deserves them both in large quantities. Great example of how as Occupational Therapists we take the whole child into consideration. Your connection with this child has made a positive impact on him- nice work. Too bad there weren't more adults around to stop the humiliation for Freddie.